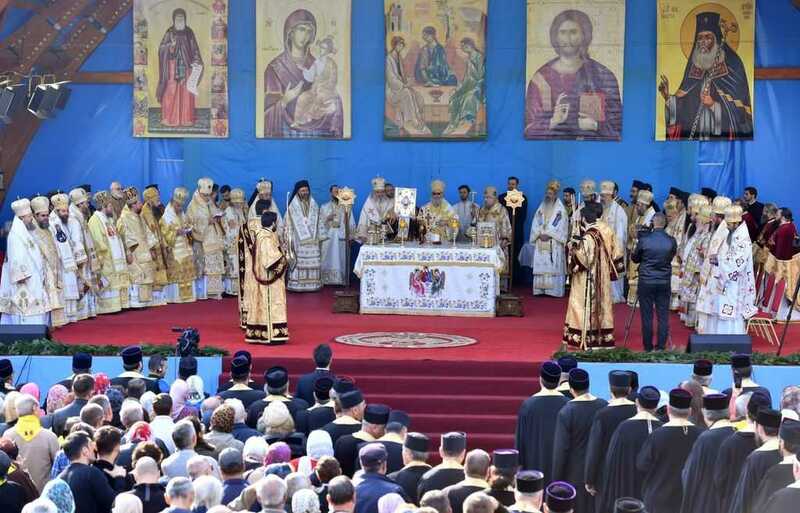 Hundreds of faithful were present at the Divine Liturgy officiated Tuesday, 27 September 2016, in Bucharest, on the feast of Hieromartyr Saint Anthimos the Ivirite. His Beatitude John X, Patriarch of Antioch and all East, His Beatitude Daniel, Patriarch of Romania, and Metropolitan John of Rustavi, representative of the Patriarch of Georgia, concelebrated. His Grace Paisie of Lugoj, Assistant Bishop to the Archdiocese of Timişoara. Numerous state representatives and representatives of the diplomatic corps in Romania were present, among whom we note His Excellency Ilia Giorgiadze, Ambassador of Georgia to Romania, Mr Sergiu Nistor, adviser of the Romanian President, Mr Victor Opaschi, State Secretary for religious affairs. After the gospel reading, His Beatitude Patriarch John addressed to the faithful, referring to Hieromartyr Saint Anthimos the Ivirite as an icon of love, under which gather the well-believing peoples of the Churches of Romania, Antioch and Georgia. At the conclusion of the Divine Liturgy, Metropolitan John of Rustavi read out the message of His Beatitude Ilia II, Catholicos-Patriarch of Georgia. On the one hand, Saint Anthimos the Ivirite led a selfless struggle for the national identity, and on the other hand, he demonstrated that true neighbour does not have nationality but ministry to God prevails over all. The humbleness of the Romanians, their love for God and their goodness strengthened Saint Anthimos to generously give out love throughout the 26 years of his ministry – to build dozens of churches, work in various fields of art, be a philosopher, a theologian, an interpreter and an organizer of publishing work in Romania, who made this country the centre of international publishing. Next, His Eminence Archbishop Casian read out the Commemorative Synodal Decree of the Romanian Orthodox Church on the 300th anniversary of the martyrdom of Saint Anthimos the Ivirite, Metropolitan of Wallachia. To honour the memory of Saint Anthimos the Ivirite is a duty of conscience of the entire Romanian people for his contribution to the development of printing and of the Romanian liturgical language. (…) The example of Saint Anthimos the Ivirite, who dedicated his life to Christ the Lord, unto a martyr’s death, and his prayers sent up before the throne of the Most Holy Trinity are a source of inspiration and renewal for the life of our faithful, but also for strengthening the fraternal communion among our Churches around the saints who defended Orthodoxy in difficult times. 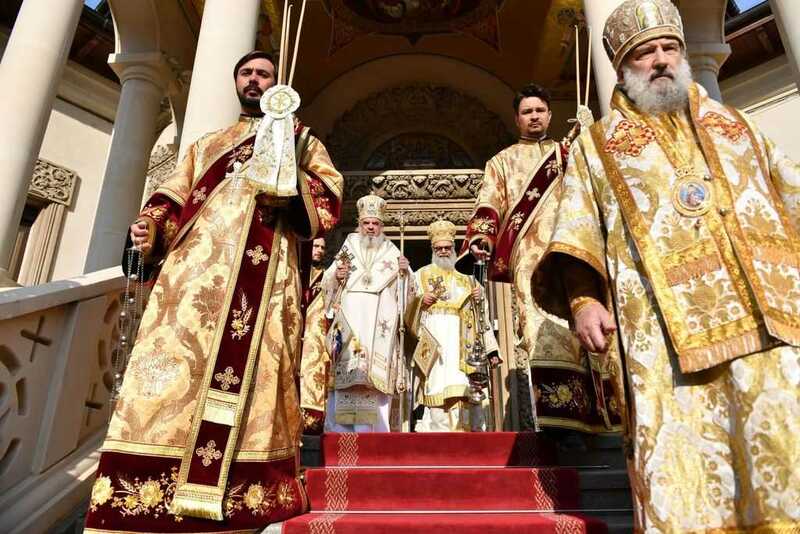 Following the reading of the commemorative Synodal decree, His Beatitude Patriarch Daniel addressed thanks to Patriarch John of Antioch and Metropolitan John of Rustavi, the delegations of the two local Churches, as well as to the Romanian hierarchs for concelebrating the Divine Liturgy in the honour of Hieromartyr Saint Anthimos the Ivirite. In addition, the Patriarch of Romania thanked the state representatives who were present, and all those who were involved in organizing the commemorative manifestations dedicated to Saint Anthimos. 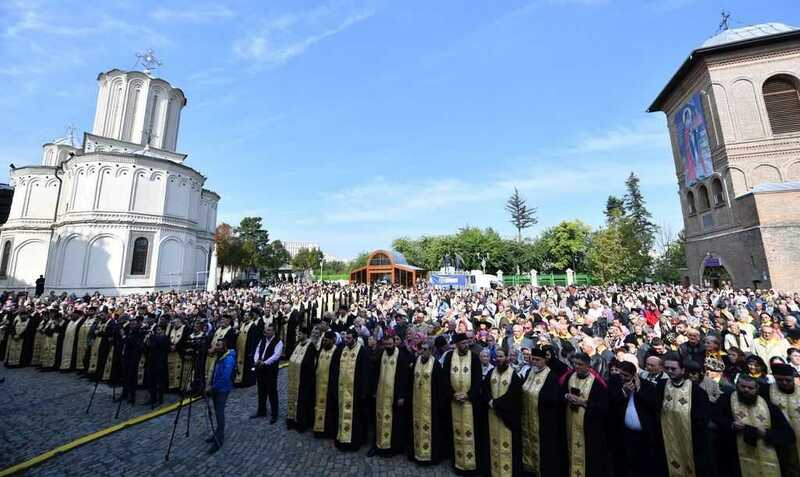 As a sign of appreciation, gratitude and fraternal love, His Beatitude Patriarch Daniel offered the Patriarchs of Antioch and Georgia an icon depicting Saint Anthimos the Ivirite, and a hierarchical crosier, an exact copy of the crosier of Saint Anthimos kept by the Archdiocese of Râmnic. 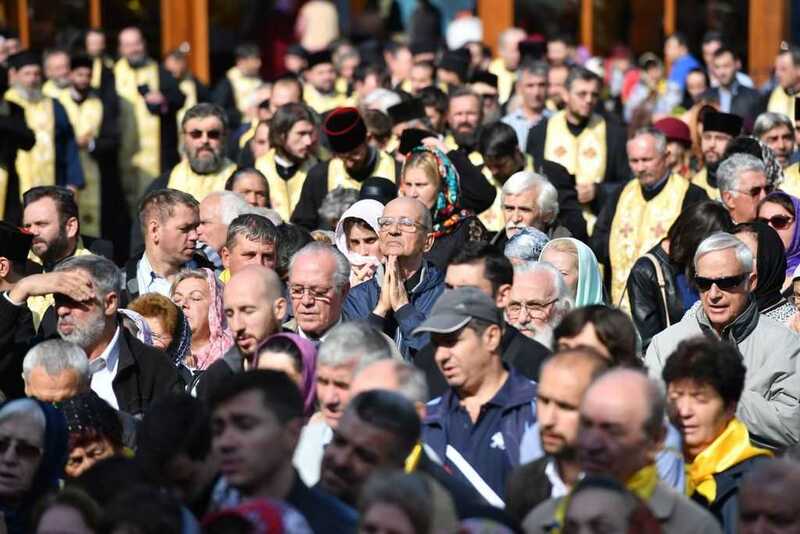 The fact that the saints gather us in prayer and in the joy of Orthodox Communion represents a great blessing, His Beatitude Patriarch Daniel said. 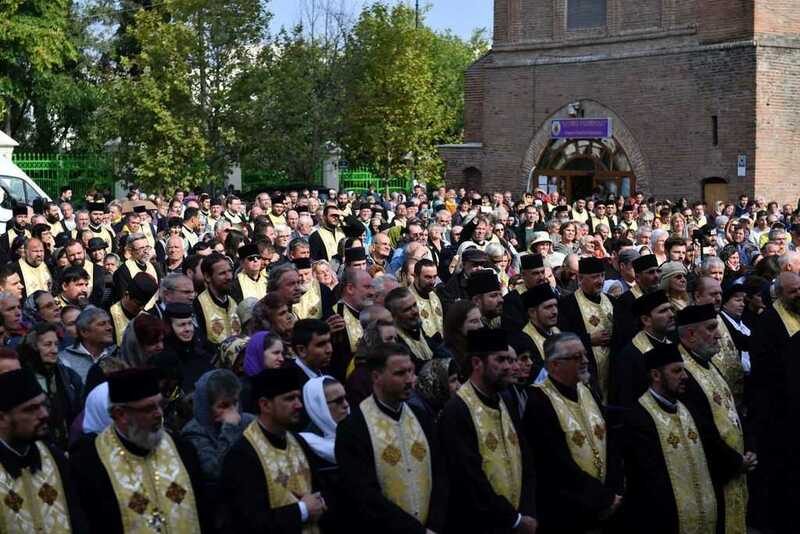 The Primate of the Romanian Church also expressed his solidarity towards the faithful of the Church of Antioch, who are troubled by military conflicts. We pray to God that peace may be restored soon, so that we can help the places of worship affected by war. This entry was posted in Featured News, News and tagged Assistant Bishop, Divine Liturgy, Georgia, Metropolitan John, Saint Anthimos by Orthodoxy Cognate PAGE. Bookmark the permalink.